Sometimes you start reading a series book about a favourite character, and really start to wonder if the author is annoyed with them, subconsciously punishing them for being too popular, or just enjoying applying the thumb screws for a change. 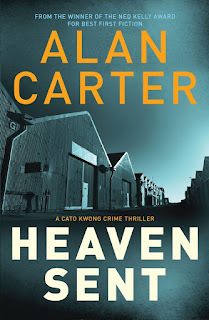 Whatever is going on, Alan Carter isn't making it easy for the popular, easy-going, and seemingly content Philip 'Cato' Kwong in HEAVEN SENT. Settled in his personal life with a new wife, new daughter and a tricky but improving relationship with his teenage son, Kwong's professional life is relatively stable as well - at least he's not serving his time in the remote reaches of WA on the "stock squad". He's back in Fremantle, and seconded to major crime when a series of murders of homeless people escalates. Whilst Kwong is dealing with the more traditional elements of a serial killer investigation, journalist Norman Lip is taking a more dangerous path - flirting online with the killer. Especially as it starts to look like this killer has thought this through much more carefully than Lip and has a very personal grudge against Cato Kwong. For readers new to this series, you'll find plenty here to give you hints and tips about Cato Kwong's background - including the acquiring of his nickname. You'll find out enough about his policing past to fill in the gaps, and more than enough about his personal life to explain his satisfaction with his current circumstances, and his almost wilful blindness to some of the struggles his wife Sharon is experiencing with new motherhood. If it's any consolation his domestic blindspot also includes his teenage son who is struggling with two parents who have moved onto other partners, other kids, and other lives. There's plenty there to make the reader really want to give Kwong a good shouting at in places. Which is the great part of this series - Kwong feels like a real person, he's a good cop, who is capable of making good, inspired and profoundly daft decisions. He's a good bloke who loves his family and totally and utterly doesn't get what's happening around him all at the same time. He's caring, concerned, blithely ignorant and utterly interconnected. In other words he's real, and annoying and endearing all at the same time. The plot here is also something that readers who are new to the series will be able to go with also, as will welded on fans (HEAVEN SENT is book number 4). As always there's a social issue at the core - in this case homelessness in a society that's seemingly well off and privileged. The sense of community is strong, with homeless support services, police and local government all too aware of the people who live rough in the place. The fact that the killer is also able to tap into that local knowledge creates a claustrophobic overlay, reminding you that few people are ever really truly under the radar. Dotted throughout, as always, are perfect little observations, Sharon Wang in her struggles with new motherhood and isolation, is still able to summons a bit of fierce when required. Kwong's old love interest and colleague Tess, reminds us of the never-ending problem of toxic male violence that many women live with. Naomi Lip, journalist Norman's sister, wheelchair bound and physically restricted reminds us that mental acuity, wit and ability are often less visible, but much stronger. 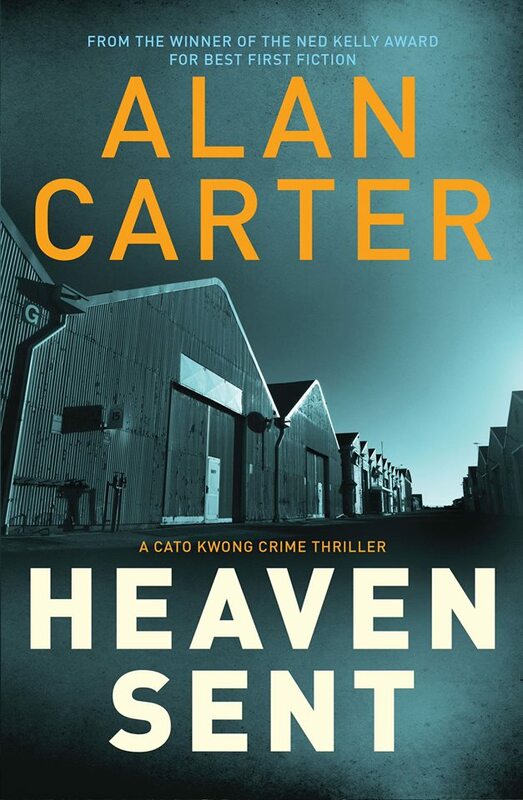 HEAVEN SENT has been much anticipated, as it's been a bit of a gap since the last outing with Cato Kwong. Let's hope there's plenty more to come.